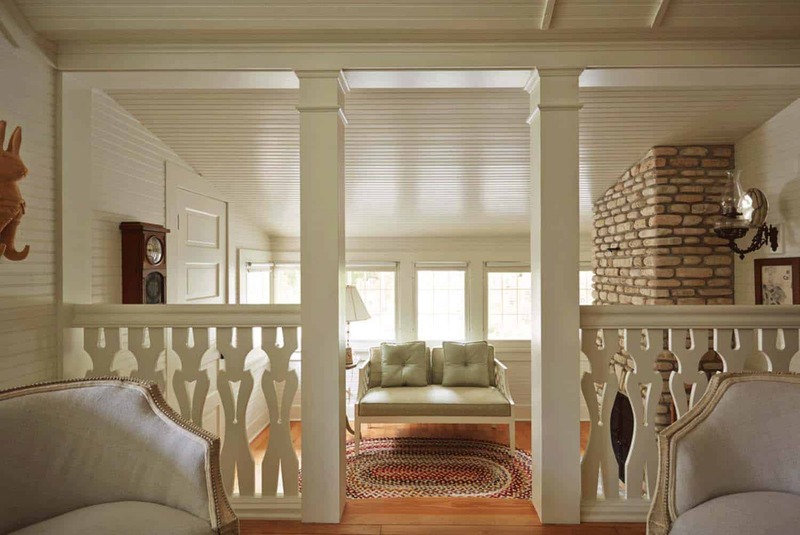 This romantic cottage was designed by Wade Weissmann Architecture in collaboration with Peabody’s Interiors, located in Door County, Wisconsin. Door County is on a peninsula between Green Bay and Lake Michigan. 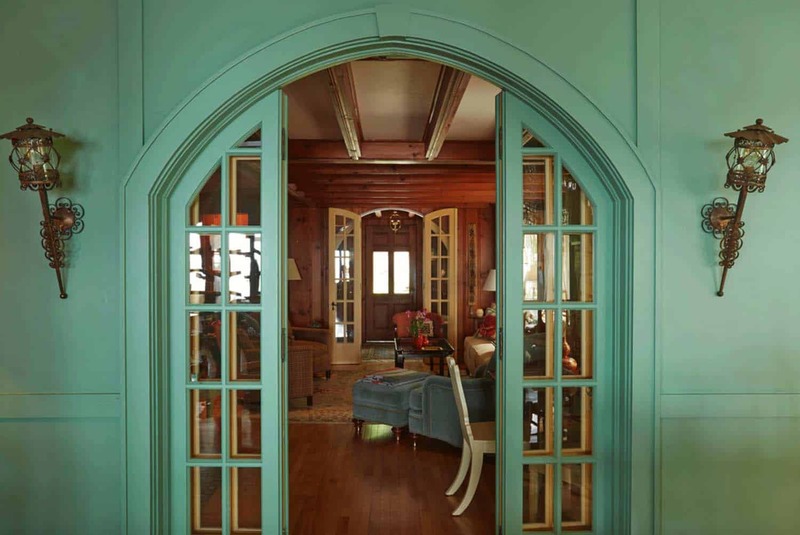 This traditionally styled home offers magnificent lake views with beautiful architecture to match. 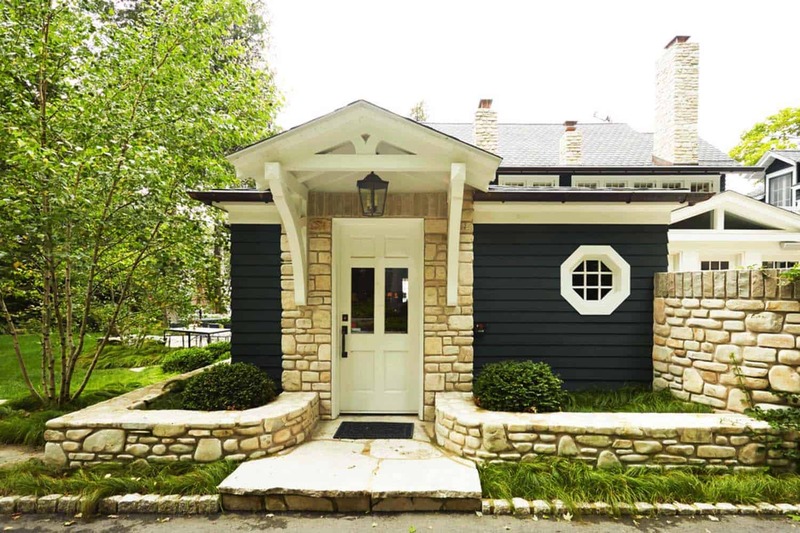 Local limestone graces the exterior facade of the main residence. 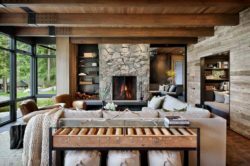 The interiors were designed to offer a comfortable living environment for this captivating home. 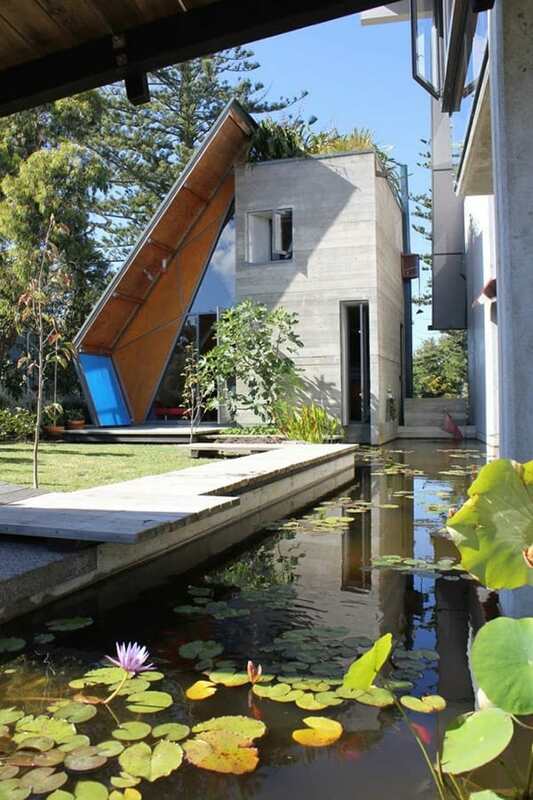 Here is the background story: This quirky home, along with a coach house, garage and boathouse, have resided on the property for 100 years. 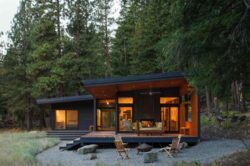 Over the course of many years, it had been altered multiple times, which prompted the homeowners to ask the architects if they should bother to renovate or just tear it down. 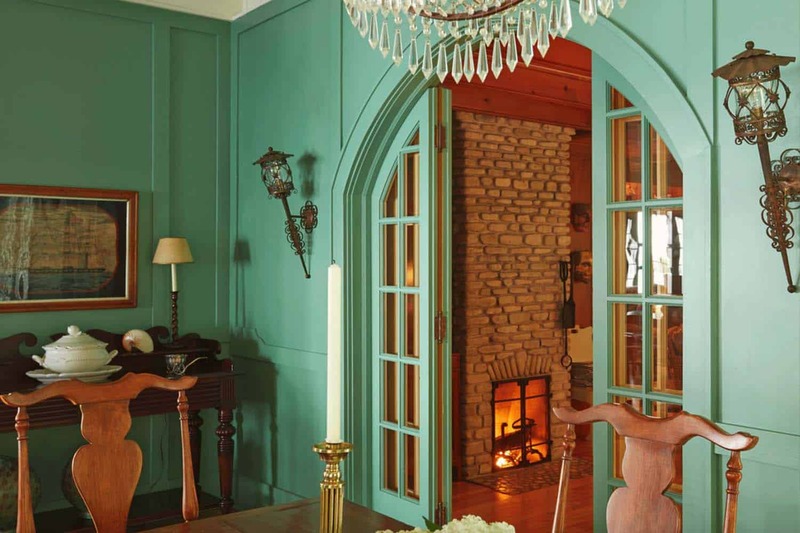 The architects found that the history of this home to be peculiar yet enchanting and decided to set out on a journey to fully renovate and update the home. 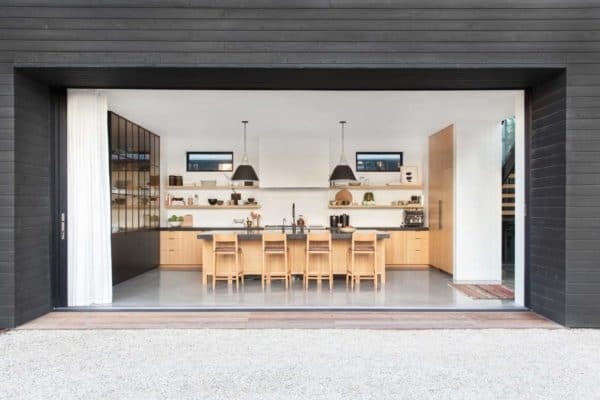 Close attention to detail was made on the kitchen, rear porch and several other spaces that had undergone somewhat odd additions. The entire process took two-and-a-half years to complete. 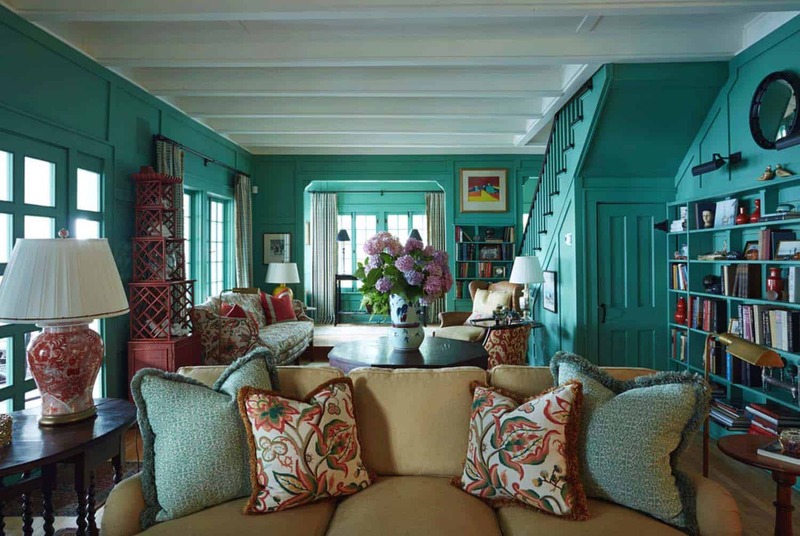 Above: The main level of this home uses a transformative teal color palette. Textures are highlighted, illuminating patterns and printed fabrics as well as new accessories. 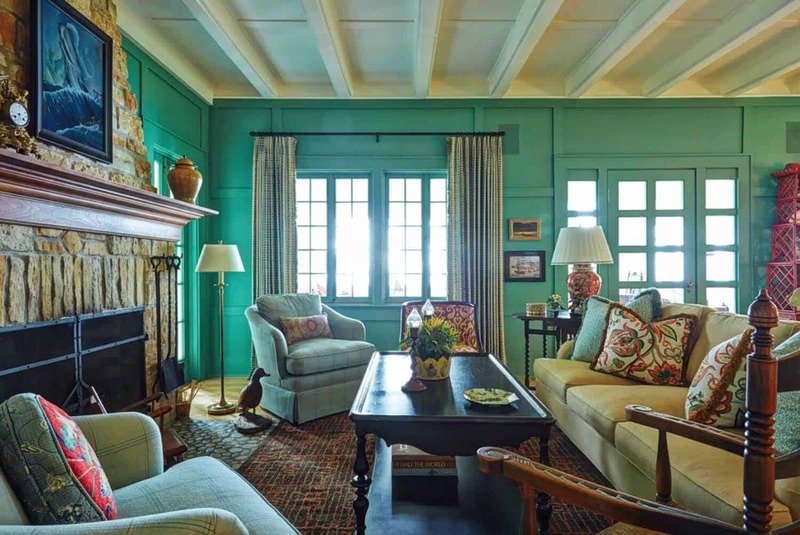 Teal walls creates a striking contrast to the all-wood parlor room. 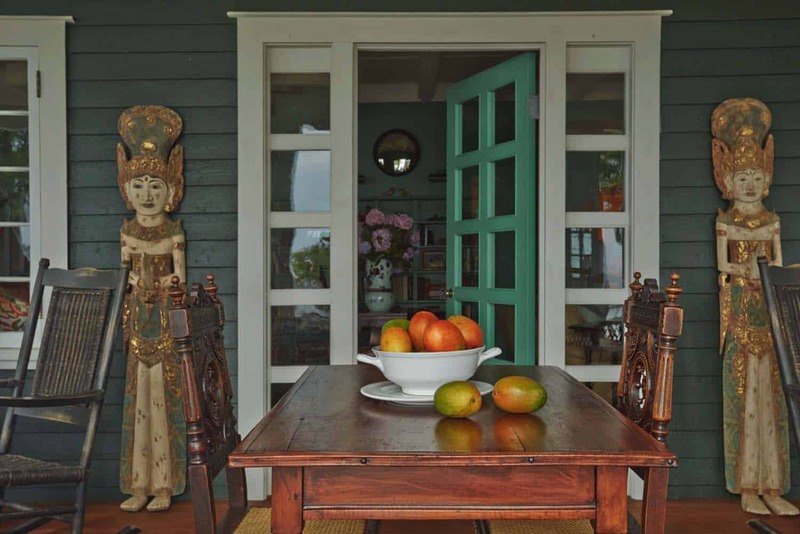 Antiques and collectibles lends a memorable experience to this home. 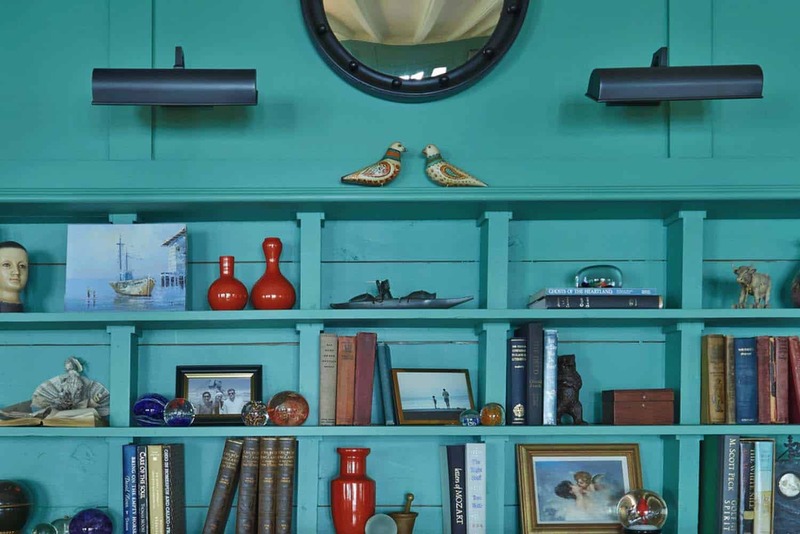 The antiques were sourced all along the peninsula, helping to bring each space together. 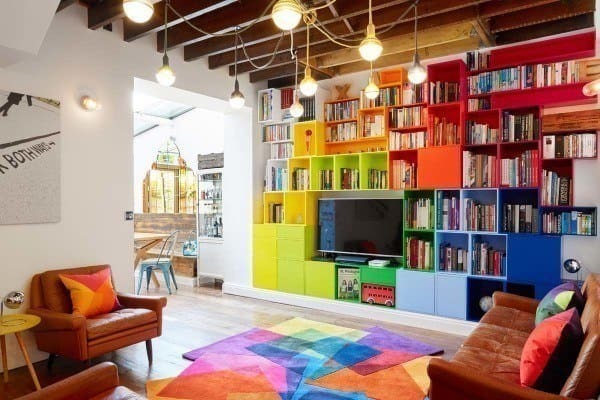 They also help to add personality and make spaces feel lived in. 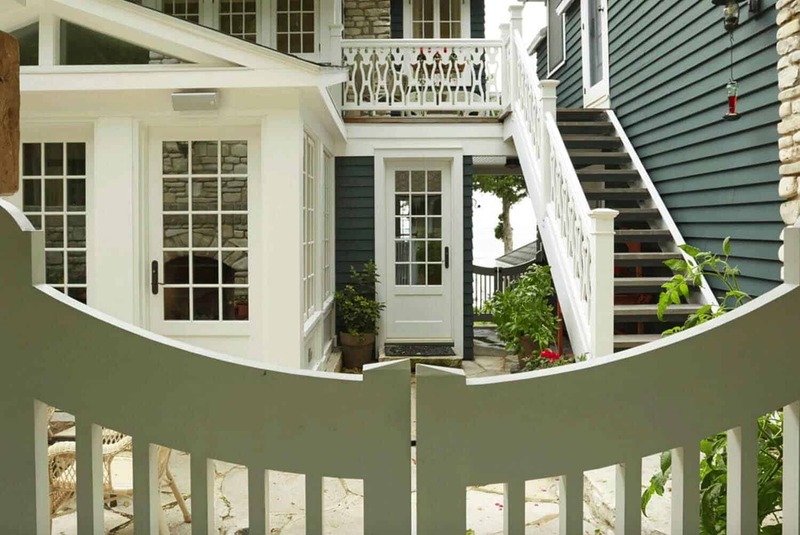 What We Love: This romantic cottage offers a unique history with plenty of charm and a traditional lake house style. 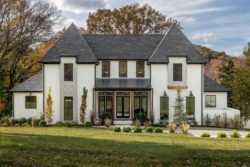 With historical features preserved and modern updates added, this homes offers a lived-in feel that is warm and inviting. The exterior surroundings are just as divine. With cozy outdoor living spaces offering captivating waterfront views that offers a feeling of relaxation. 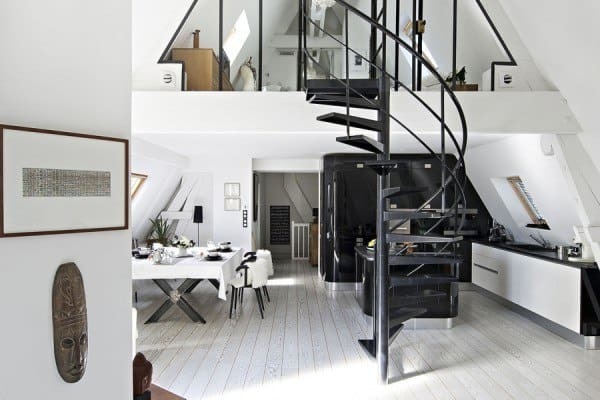 Readers, what do you think of this home, do you find it to be charming? Please share your thoughts in the Comments! 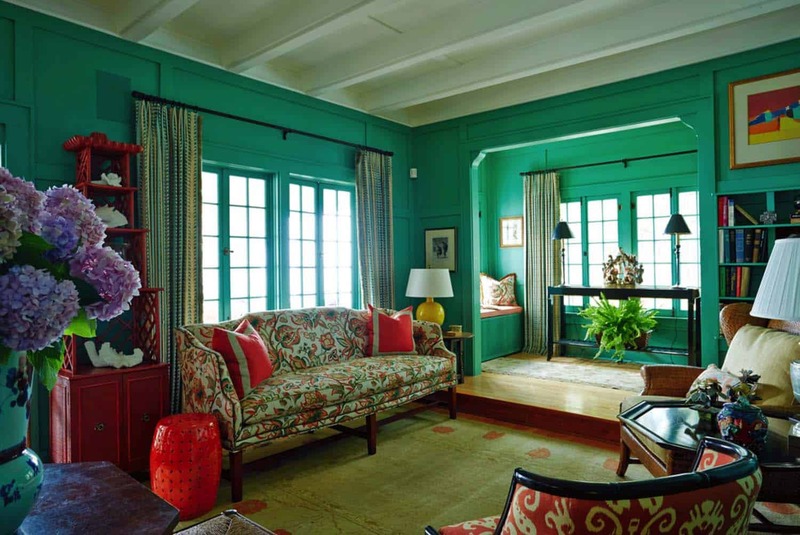 Above: The teal color on the dining room walls is original to the home. The ship chandelier and the wall scones are family pieces, while the dining table was sourced from a local antiques shop. 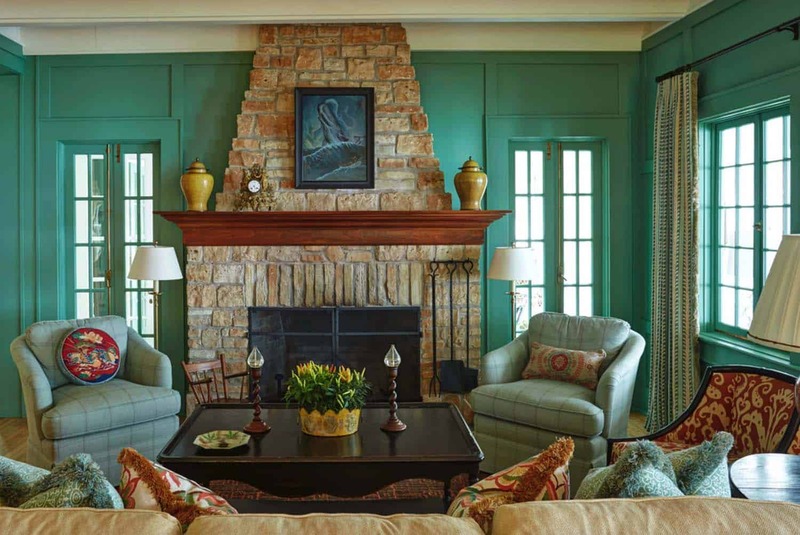 Above: The pine walls of this cozy TV room are original to the house. 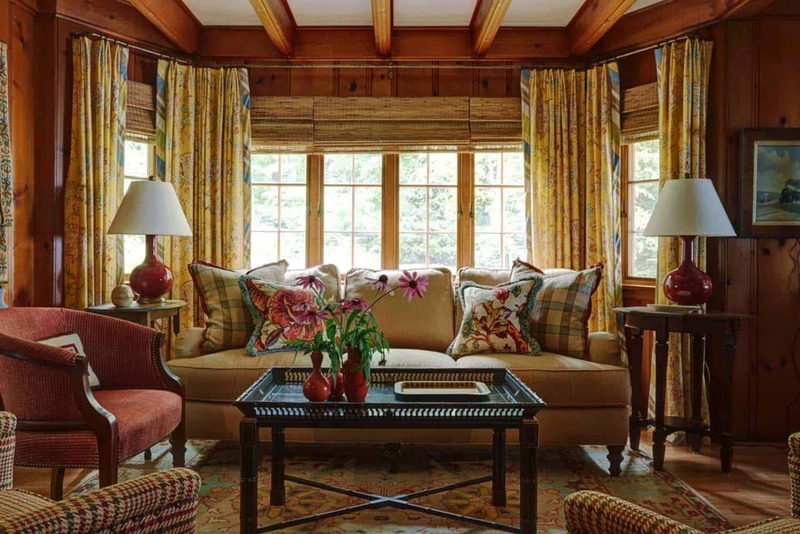 The warm color palette mixes yellows, red, and teal. 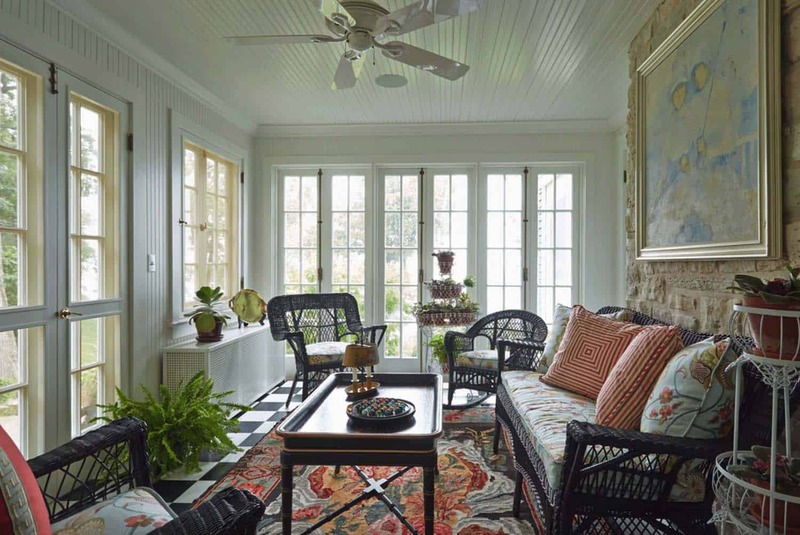 Above: The homeowners call this space the garden room, brimming with natural light and charming details. Wicker furnishings were painted black to compliment the antique Karabaugh kilim rug. 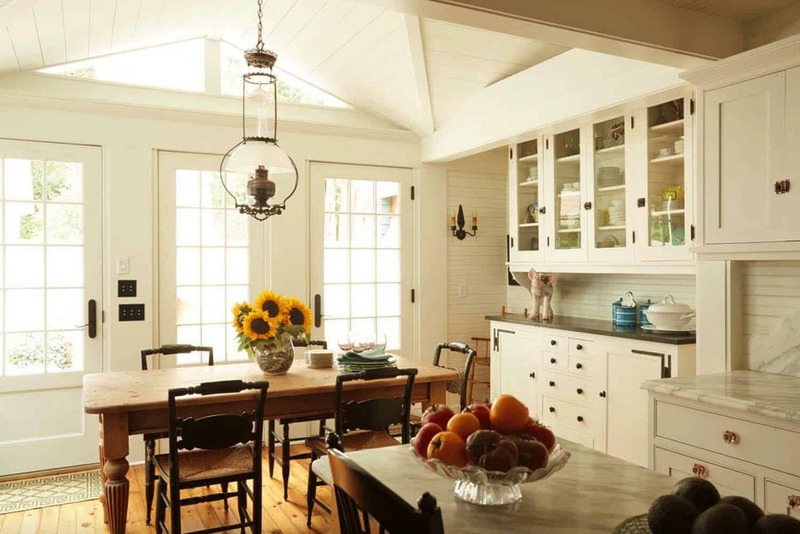 Above: The antique pendant light over the dining table was sourced from a local antique store and electrically wired. 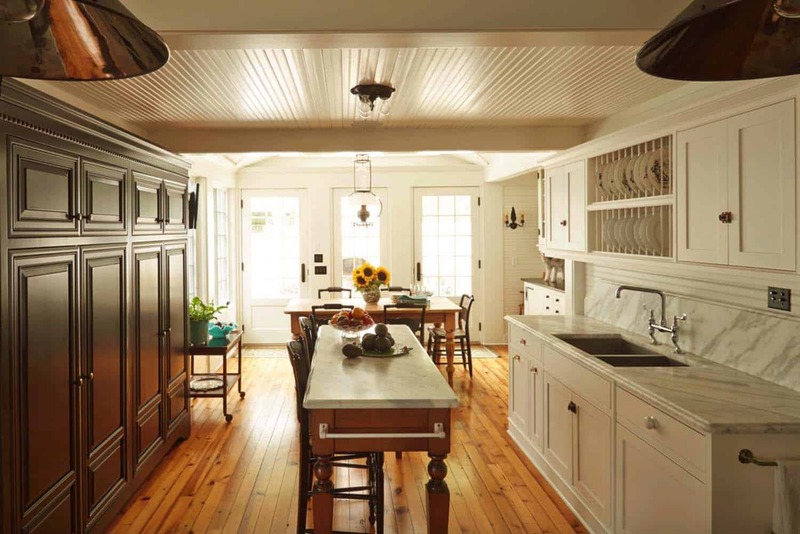 Above: The kitchen cabinets were removed, stripped and relocated to create a brand new layout. 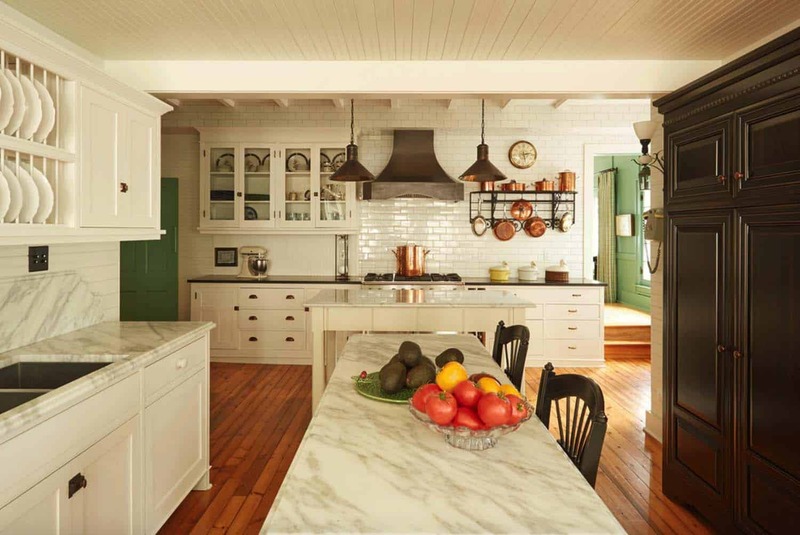 Carrara marble graces the island and most of the countertops in the kitchen. The perimeter countertop used for cooking features honed granite, which has the look of soapstone, yet is more durable. 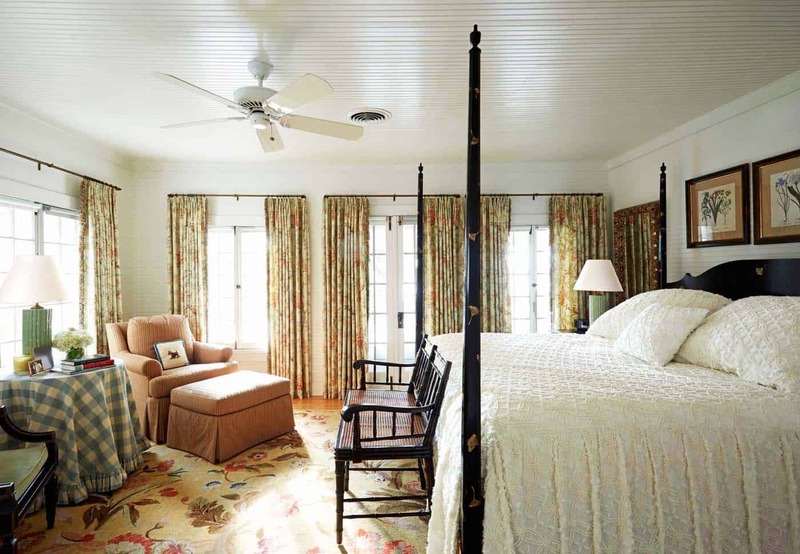 Above: Redesigned for the homeowners adult children, each bedroom was designed to be casual and comfortable. 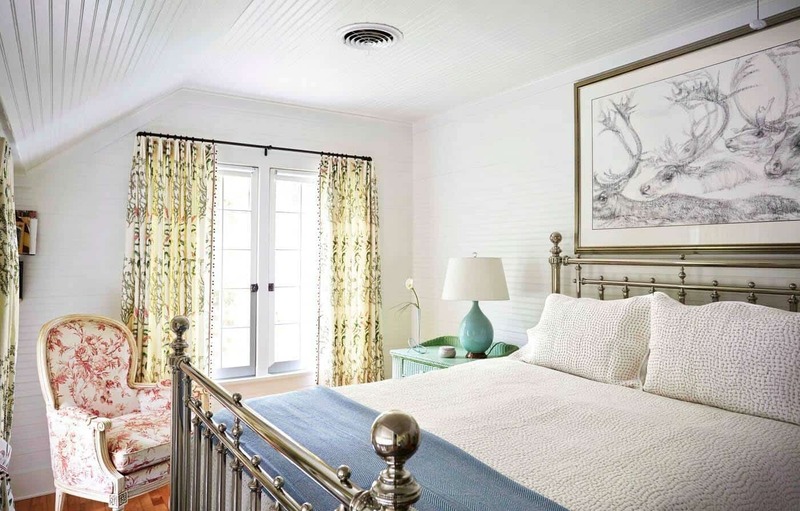 The spaces offer a light and airy palette with natural linens and details reminiscent of coastal New England. 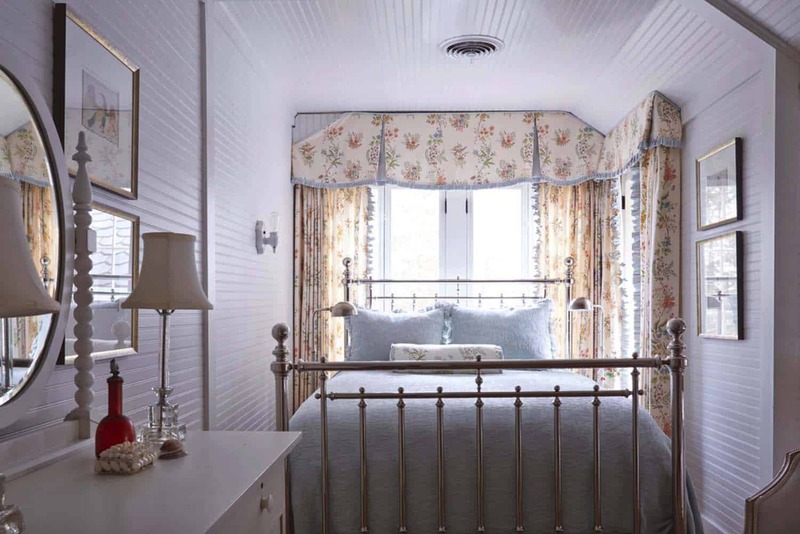 Above: Beadboard ceilings and walls add to the casual charm of this romantic style bedroom. 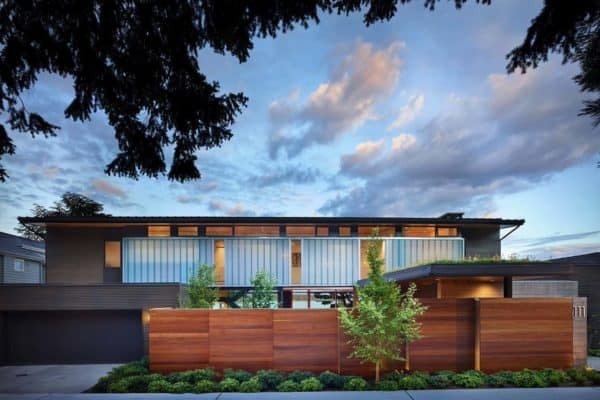 Above: On the upper level of this home, the architects took two-step-down sleeping spaces that were attached to two of the bedrooms. 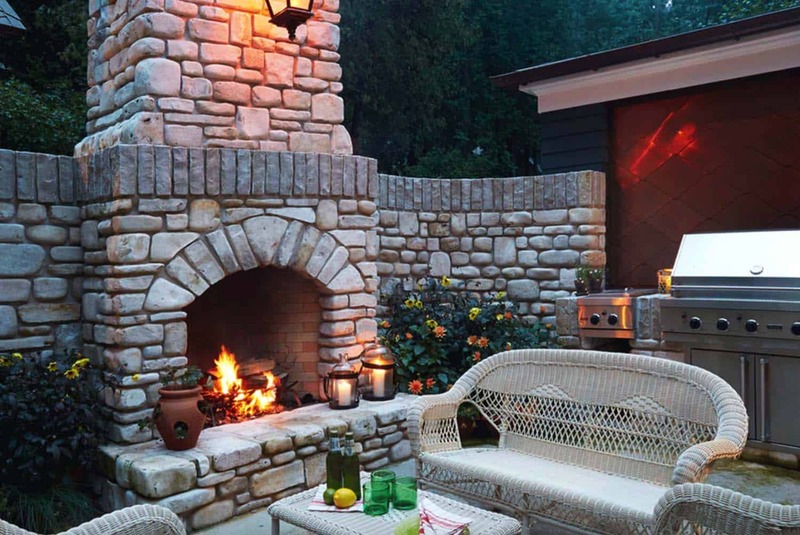 They were converted into sitting rooms, complete with miniature fireplaces made of natural stone. 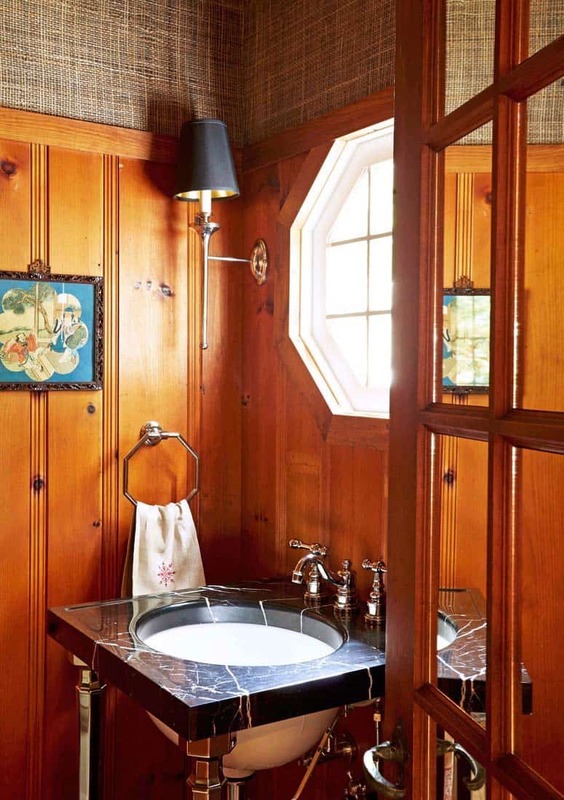 Above: A Jack and Jill bathroom connects the sitting areas of the daughters’ bedrooms. 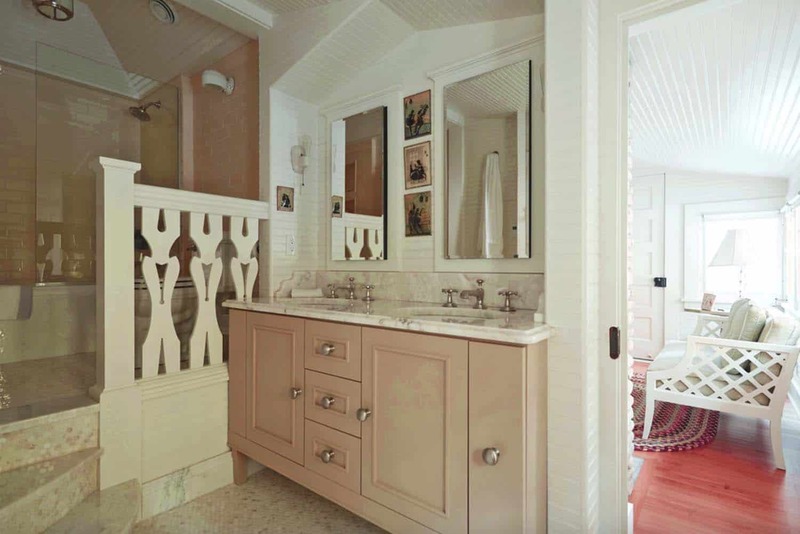 Eastern White marble tiles on the floors and walls were sourced from Ann Sacks. 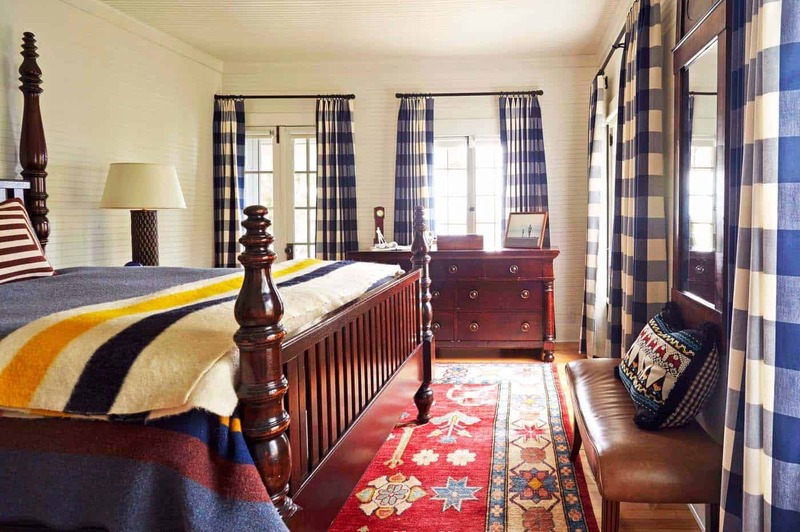 Above: The son’s bedroom portrays an “All-American” vibe, with its Pendleton blanket and custom-designed gingham curtains. 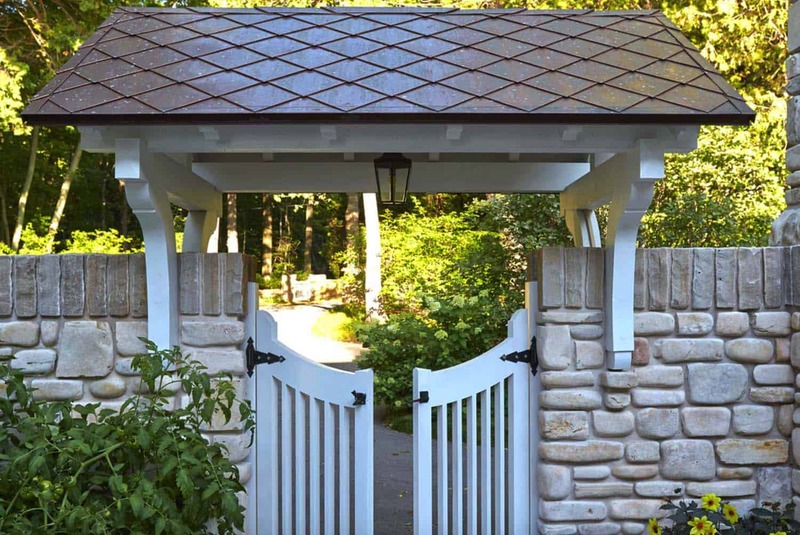 Above: Porches were fully renovated and modernized with dropdown screens and windshields, and a stone wall and fireplace were added to an exterior space, thereby creating an outdoor room for cooking and gathering. Absolutely beautiful. A great job tying in all the years of different people occupying the home. The interior design elements are fresh, yet classic.